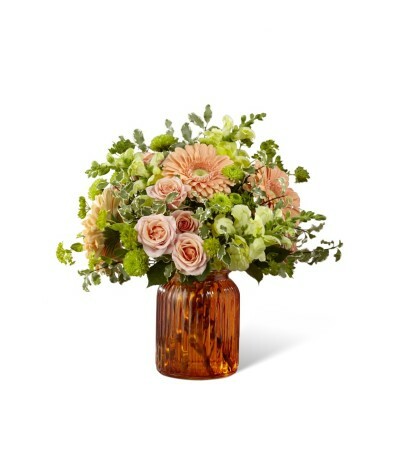 FTD® proudly presents the Better Homes and Gardens® Peachy Keen™ Bouquet. 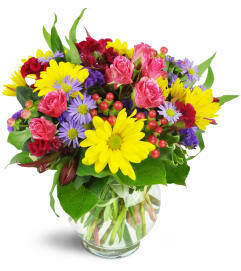 A soft expression of style and true charm, this fresh flower bouquet is ready to create an unforgettable moment for your special recipient. 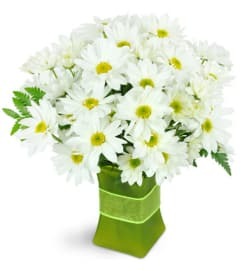 Peach gerbera daisies give this arrangement a homegrown feel, surrounded by peach spray roses, yellow snapdragons, green button poms, and a variety of lush greens to give it that fresh from the garden look. 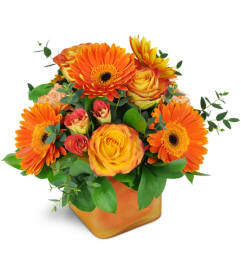 Presented in an orange glass vase to finish the overall styling of this beautiful fresh bouquet, this arrangement is set to create a wonderful thank you, thinking of you, or happy birthday gift.